GARDENA — “Creative Community Policing” is the topic of the next meeting/program of the Greater L.A. Chapter of the JACL on Sunday, March 18, at 2 p.m. at Merit Park Recreation Hall, 58 Merit Park Dr. (off 158th Street) in Gardena. The speaker will be Capt. Michael Ishii, Administrations Division, Hawthorne Police Department. He will discuss how police departments are working to build trust and respond to communities’ needs through the success of innovative community policing programs, and how individual officers are going “above and beyond” their regular duties to help and mentor teens and young adults by teaching them valuable life skills. 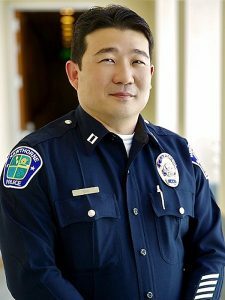 Ishii has been with the Hawthorne Police Department since 1990. his experience encompasses an array of assignments, including motor officer, field training officer, internal affairs sergeant, public information officer, patrol bureau watch commander, and detective bureau commander. He was promoted to captain in 2010 and has overseen both the Administration and Operations Divisions, along with the city’s Information Technology Services Bureau. He holds a master’s degree from CSU Dominguez Hills in negotiations/conflict management and a bachelor’s degree from CSU Long Beach in communication studies-interpersonal and organizational communication. He is also a member of the National Association of Asian American Law Enforcement Commanders (NAAALEC). In 2011, Ishii was part of the Hawthorne PD team that helped create the national “Coffee with a Cop” program, which has gone on to become one of the most successful community policing programs with events held in all 50 states and 16 countries, in four languages. He also developed the National Coffee with a Cop website and currently oversees the National Coffee with a Cop Day initiative. As a co-founder of the program, Ishii has developed an expertise in branding, marketing, working as a nonprofit organization and what it takes to be a global brand manager of the Coffee with a Cop program. Born in Japan, Ishii grew up on a U.S. military base near Tokyo and is fluent in Japanese. He will be asked to share his thoughts about being Japanese American in a leadership position and share tips and tools to help young adults achieve success in leadership positions.